The half-sister of slain NFL star Sean Taylor testified Tuesday that many of the suspects accused of being part of the botched robbery that led to his 2007 fatal shooting had been at his Palmetto Bay home the month beforehand – celebrating her birthday. Sasha Johnson said her brother gave her a generous birthday gift on Oct. 1, 2007. "He gave me a purse, a candle, a card, and money," she said, on the second day of the trial of Eric Rivera, 23, who is charged with first-degree murder and burglary with assault or battery in the death of Taylor, 24. Johnson, 27, told a prosecutor that he gave her $10,000 in cash – and that another suspect, Jason Mitchell, saw it happen. "Everything was in the purse. When I pulled it out, he was right there and he saw it," Johnson testified about the cash. Prosecutors allege that the suspects saw the money and returned early on Nov. 26, 2007 to steal cash they thought Taylor kept in his home. 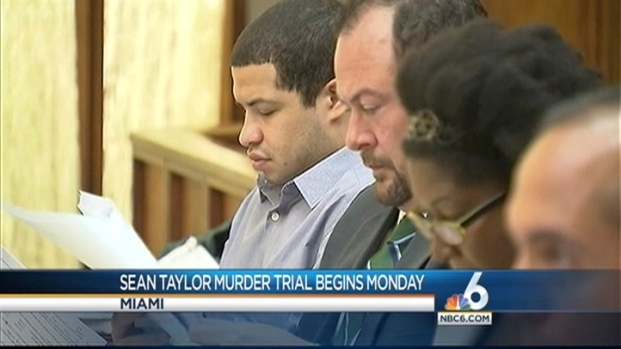 Jury selection wrapped up Friday in the trial of Eric Rivera, 23, who is charged with first-degree murder and burglary with assault or battery in the 2007 death of NFL star Sean Taylor in Miami. Openings statements will begin Monday. According to prosecutors, Rivera, Mitchell and three other suspects thought Taylor was not home when they drove from Fort Myers to burglarize his house. But Taylor was there, and confronted them with a machete when he was shot by Rivera, prosecutors said. Johnson said her then-boyfriend Devon Wardlow attended her birthday party. He is also accused in Taylor's killing, along with his brother Charles Wardlow. Johnson also testified that Rivera once played for a youth football team in Fort Myers coached by her father. Rivera, Mitchell, Charles Wardlow and Timothy Brown have all pleaded not guilty in the case. The fifth suspect, Venjah Hunte, pleaded guilty to second-degree murder and burglary and may testify against the others. Rivera is the first to go to trial and faces a potential life sentence if convicted. His trial had an emotional beginning Monday as opening statements were delivered and Taylor's girlfriend, who was home at the time of the shooting, gave tearful testimony. "I heard a really loud noise, very similar to a gunshot and a scream, like 'ahhh,'" girlfriend Jackie Garcia said. Miami-Dade Police got a tip that led them to Rivera and the other suspects, and when Rivera was questioned by detectives, he made a full confession, prosecutors said. "Sean Taylor was murdered, shot and killed by this defendant Eric Rivera. Murdered outside his bedroom door," Assistant State Attorney Ray Araujo said during openings Monday. "He fell to the ground and as he bled the defendant and his friend drove away into the night." But defense attorney Janese Carruthers argued that detectives wore Rivera down and coerced him into the confession. Taylor, a two-time Pro Bowl safety for the Washington Redskins, had starred at the University of Miami, helping the Hurricanes to the national championship in 2001. Tuesday’s proceedings featured lengthy testimony from a Miami-Dade Police crime technician, John Mancini, who detailed shell casing and projectile evidence found at the scene. Mancini said two identical 9mm bullet casings were found inside Taylor’s home, one outside his bedroom and one on a sofa near a rear sliding glass door downstairs. Rivera shot out the sliding glass door so the group could escape, according to investigators. One problem for prosecutors is the gun was never recovered. That’s because Rivera dumped it in the Florida Everglades, they said.